Nursing degrees from Washburn University have become a family affair for four Osage County women. Kelsi Wiscombe, of Overbrook, is one of six students from Osage County who will graduate from Washburn University’s School of Nursing, in Topeka, May 14. For Kelsi, the ceremony will have a special meaning for not only herself, but also for her sister, Kylie Wiscombe-Hastings, and twin cousins, Kasey and Krystal Wiscombe. All four now have nursing degrees from Washburn’s nursing program. 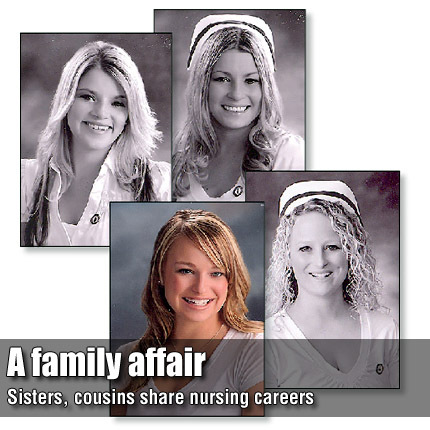 Kasey and Krystal received their nursing degrees in 2009, while Kylie got hers in 2010.